NEWS ALERT _ This last week Angel was announced the winner of an award for THE JUNGLE BOOK as the best illustrated book in Spain for 2010! Interview with Spain’s leading illustrator, The Golden Age continues! Jennifer: Fans of Dulac and Rackham do not despair, they have a worthy successor. 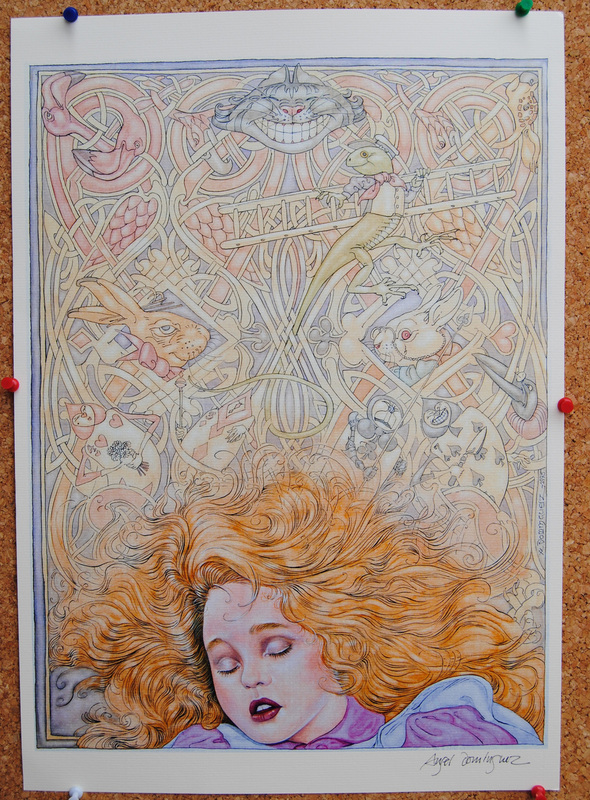 The art of Angel Dominguez has already been compared to the master illustrators of the Golden Age of book illustration. He has the vibrant colour and pattern of Dulac and both the delicate and the quirkily grotesque approach to fantasy characterisation for which Rackham was famous. Angel, I believe you formally started your career in illustration in 1971? What influenced you to choose such a career? Are there other artists in your family background? Angel: “Curiously and curiously” as Alice says… because my master is Arthur Rackham, but you´re right, I also love Edmund Dulac. Many people say I´m more like Dulac. In writing on the topic,“The Master illustrator of the Golden Age of book illustration”, you must write about Rackham and Dulac, both have the same quality and charm. I had an uncle, who was a very good painter in oils. So if you ask about genetics, I think that maybe there is a link, but to be an artist it is really only necessary to love art and all that’s around us. My strongest influence in choosing to illustrate children’s books was Arthur Rackham without a doubt. I remember, as a child, having a book in my hands with a little and awful reproduction of “The Mad Hatter’s Tea Party” from Alice in Wonderland. It was so bad, I was even unable to read the signature of the artist…but, in that moment, I knew I wanted to do that wonderful kind of art. I fell in love with that imaginative place too, the Mad Hatter and the other characters, with that cottage and background… I felt a lot of sensations, good inner reactions to that technique of painting. I WANTED to do the same! And further, visiting London, I saw a lot of books by that artist… and now I have nearly all his books on my shelves. I did Alice´s Adventures in Wonderland with Artisan of New York and I was the happiest man on Earth. I did The Mad Hatter’s Tea Party with special affection, and the original was sold quickly. People even asked me to paint other ‘originals’ of that same scene. Jennifer: Who were the artists, you feel, had the most influence on your style as a young illustrator and why? I love each nationality of artists in the wild, for all of the continents, but specially the Australian Aborigines, they painted wonderful art on rocks and on bark… I was so inspired, I also did some paintings in this medium. Alex Niño, Moebius, Bernie Wrightson, Sergio Toppi, Josep Mª Beá, Carlos Giménez… a lot of the world of comic. Arthur Rackham, Edmund Dulac, John Bauer, Beatrix Potter, Kay Nielsen… a lot too. Speaking of ART… I must mention too Gustav Klimt, Egon Schiele… and the masters of China and Japan, specially Hokusai, whose books on Manga were one of the most wonderful pieces of art that I ever saw. Jennifer: What inspires you most in the creation of your art? Angel: Animals and plants… Nature, Beauty and Love. A beautiful lady, a nice orchid, a wonderful gorilla, an elephant… the amazing giraffe, that incredible animal which still is with us on this planet. The blue whale… the little mice, the birds… with colors and forms without end. To save the wonderful creatures in this amazing world is in the forefront of my interest, so, painting them to show all their beauty and their interaction with their interesting human companions as they appear together in the wild, this is my goal. As Sir David Attenborough said, he likes to show nature’s wonders in order to preserve them; he never liked to do movies with “distressing messages to the innocent bystander who was at home sitting in their chair.” But it´s difficult, you cannot forget, for example, the bushmen of the Kalahari desert, who are disappearing so fast, already it is a challenge to find a family complete – and all due to the diamonds under their feet… and the powerful people don´t know that the true diamonds are these very same tribes folk? The variation in art inspires me… I see a wonderful book on Celtic art and I WANT to do Celtic art… I see an interesting carved wood or stone… and I would like to do the same. In fact, I saw a picture by Arthur Rackham and that was the start in my career as illustrator, I wanted to do images like that. Jennifer: Every body is different some can only paint when inspired, some have a daily routine. How do you approach your work? Angel: Setting down to work is a daily ‘routine’, constantly having in mind the sketch book for each work in which roughs are done when I´m inspired, so, the results come together in the right way. Routine is a word that artists must categorise as ‘forbidden’. In fact, I hate schedules, or… I´m unable to use them, so, let me see… I think that I don´t use schedules nor “daily routine” per se! This, speaking of my work in the fantasy genre only, because I also work on wildlife art, which is the easiest for me, and in this case, routine isn’t a trouble to me. The truly ‘work’ of art is the fantasy world. The inevitable is to work hard. Jennifer: Does your native region of Basque Country, its geography, history and legends play a part in who you are as an artist and has it influenced your style? I know you travel in Europe and the United Kingdom and Celtic influences are obvious in your love of delicate, interwoven patterns and symbols. How have they come to be part of what is your signature style? Angel: As a Basque, I think that the woods of this country inspired me as much as the wild life of England near where Rackham lived at Arundel, inspired him; he loved trees, me too. The mountains and nature of Basque Country are a magnificent source of inspiration to me, and have been from my childhood. Also the Basque Myths are interesting to me, and our books are feature plenty of faery characters of all kinds, … perfect for my fantasy. Of course, every time I do a trip, I take a lot of sketches and photographs, I want to carry with me every wonder that I find. I like the Pubs of London a lot, I have photographs of almost every one of them, and I wanted to do a book only on pubs… well, I did some pictures and two of them were printed in my book Diary of a Victorian Mouse. One of these Pubs, The Porcupine, did a set of postcards of my drawing in this book, and they were sold in that Pub. To drink a pint of good beer looking at these postcards was a nice moment. Also, I knew in England the wonderful Celtic art in the Book of Kells and Lindisfarne Gospels, what a collection of striking calligraphy and patterns and borders… I love all of these wonderful books. Jennifer: You have an obvious love for storytelling, your pictures talk to the viewer, do you deliberately put layers of story into your works or is this a right brain thing that happens as part of the creative process? Angel: Both, I think. We the illustrators, well, the artists in general, we put in our creations our acquired culture throughout our lives, spontaneously, and those details which aren´t spontaneous, with hard work. So, the viewer can admire our culture and enjoy our hard work. Jennifer: You have a very keen eye for detail, especially in your drawings of wildlife. But your animals are more than just good anatomical representations, they leap from the page! Do you carry a sketchbook with you, a camera or do you rely on memory or zoological sources? -“Yes, and so it is because I forget everything”. Always I carry a little sketchbook with me, and when a good idea comes, I draw it… and after, I put it in larger sketchbooks, which often have better drawings than in the same published books! Jennifer: Can you share with me and the readers some of your earliest experiences with art? Angel: The very first, as a baby… was an “O” filled with a pencil… I needed to fill that blank room. Well, this book, of my father, is still with me, and I have no better drawings with me from my childhood, which was awful. Due to the work of my father, we were doing trips up and down to many places, and all my drawings from school and that which I did at home were lost… a pity… and they were a lot indeed. This happened to Hokusai too, but worse; all the first pictures, from a wonderful stage in his life, disappeared in a fire that burned his house… and, further, he never was able in to do them again, although he did try to recreate them. Further, as a youngster, I did comics, and I won two first prizes, with my creation Fedra, a woman of the future as heroine… and I´m thinking of following up with further work on her some day, not too much later on. I have some good ideas for her, but in the form of a book not as a comic. Jennifer: You have done some outstanding work illustrating new editions of such all time classics as “Alice in Wonderland” and “Wind in the Willows”. This must have presented some unique challenges. How do you approach a project such as “Alice in Wonderland” which has already had many well know illustrators put their stamp on it? Angel: Easy for me, I love Alice in Wonderland very much… I approached this story WITH EMOTION, which is THE GOAL OF ART, as another artist said, Goyo Dominguez –not a relative. I love this special world created by Carroll so much, that not only do I love the story but each of the characters, of course, the writer, the illustrated editions… England, in a word. I wanted to go to England to feel the origin of the book, the mood… to visit a lot of bookshops, to buy a lot of old books, not only of Alice, but of the Victorian times. Each part of my book is full of plenty of messages. And, if you look closely at many Victorian times (Carroll’s time), The Great Exhibition was held in the Crystal Palace… The objects on display came from all parts of the world, including India and the countries with recent white settlements, such as Australia and New Zealand, that constituted the new empire. So, I took advantage of this event which, at that time, had the effect of familiarizing English society with foreign wildlife, to paint the wonderful animals that you have there in Australia into the illustrations. -“Please do you be so kind to paint another six watercolors”… and I did it… and the contract arrived fast. And about other ‘meaning’… I approached the story having in mind a lot of things, not only the many illustrators, and Disney´s wonderful characters, but thinking to do a VERY good work… and I think that I did it, because the edition of 25.000 items were sold. Also I´m thinking of doing a book on this book… with a lot of interesting things from Carroll´s world, the jokes, characters and details that I included. Some details are hidden… as my own wife said, I work a lot on each plate… so much of that spontaneously included ‘meaning’ is lost. As yet I haven’t illustrated The Wind in the Willows… I only drew a pair of watercolors… and already they have been sold in England. They have yet to see the light in the form of a book… who knows, may be that will be my last book to illustrate, as Rackham himself did. Jennifer: What stories and books hold fondest and earliest memories for you? Do they play, do you think, a part in your choice of projects? Angel: Of course, Alice is one of them. I read it many years ago, many times… and, as I think that half my soul is English, I understood it very well, and I enjoyed it… specially in thinking to illustrate it. THE UGLY DUCK, the best tale I think. UNDINE by Baron de la Motte-Fouqué, another of the greatest. A lot of books and stories… difficult to remember all of them and not wanting to bore people. And of course these stories are part of my life and my love for my profession. Jennifer: Where are you hoping to take your art to next? What projects are coming up? Angel: As I learned from my English friends, it is often preferable not talk about them. This is done with a number of intentions… it prevents the risk of ideas being copied. To chose a book to do already is an idea, specially when a classic. And to the readers, if the project doesn’t go ahead, that is disappointing news… and if appears as a surprise, it´s good news, something interesting. I can say that I´m currently working on The Jungle Book by Kipling. I must get that finished this very month. Also I´m proud to said that I´m working on books with friends from JacketFlap. I´ll find free time to paint good watercolors for good stories that suit my style a lot. I must say that, at JacketFlap, I have found very good friends, not only Tracy and Eric, but others as wonderful models for my pictures. Artists are always searching for good models, and here I found a lot, who were happy to let me draw them. I have a lot of friends as models, not only in Spain, but in the States and in England. It´s funny when I gift some book to them… some have been very touched. One lovely lady cried with joyous surprise when she saw herself portrayed in a color plate in a book on pirates. Jennifer: Have you ever thought of designing film sets or dabbling in animation? Tim Burton has brought some darker legends to life in an animated film noire for older children. Have you ever thought of doing something like this? Angel: By the way, there´re a possibility that I can work with Tim in the movie of Alice which he is working on right now!. I´ll keep you posted if this goes ahead. I have some part of my brain that thinks along the same lines as Burton, but not specially in relation to the dark side of those stories, but the fantasy element. For example, The Legend of Sleepy Hollow also is one of my favourite books, also illustrated by Rackham. Not all are dark, if you see Corpse Bride, you’ll agree that it’s a tender love story. And the main character of The Nightmare Before Christmas is tender too, with the sad or smiling face, long legs, walking and dancing and singing all the time. Yes, always I loved animated films, specially Disney´s, and movies are part of our lives. And it´s a matter of luck to find someone to work with. For example, also I have a friend who can introduce me to James Cameron´s movies, and the last movie, AVATAR was suitable for me to paint the creatures, but I arrived late to this project and the Blue Lady, the main character I think, is very different than the one I could create… mine would be without tail. I knew the thriller version of this movie due to my American friend, and I envy that wonderful life in other world. Si-Fi is one of my preferences in books and movies. I love the books by Ray Bradbury, I have all of them. And I think that Arthur C. Clarke is good indeed, but I prefer the poet Bradbury, I feel his world as if it were mine. I´m pretty sure that Bradbury is the best writer in the world. I would like to illustrate each of his books or to do all of them in movies. When I was very young I liked animation a lot, to work in this world was a dream, but right now I like more doing good illustrations to books, or backgrounds and creating characters to the movies. Jennifer: Lastly, Angel, is there a question you would like to answer, something I have not covered? Now is your chance to cover it! Being a book illustrator, I have been fortunate to find a lot of wonderful friends and have had many unique life experiences. I have fans in England, USA and Australia right now… I traveled to many interesting places, but the most fascinating of them was Jordania, where I met Queen Rania and I collaborated on a book with her! Also I´m working in four projects with friends I have met through Jacketflap. -MICHAEL O´MARA BOOKS and VICTOR GOLLANCZ of London. -IBAIZABAL AND ELKAR of Basque Country. Lastly, I wish PEACE in the world… all of us must take advantage of every opportunity to tell how important is to save the world from a sooner end. This interview is such an opportunity. One of the wisest men in the world, Jose Luis Sampedro, a Spanish writer and a very old and peaceful man, said yesterday on TV in Spain that the end of the world is in the hands of the powerful people but crisis doesn’t damage them, so, they don´t want to look for a solution. Angel is holding two exhibitions in Britain. The link to the first is below. 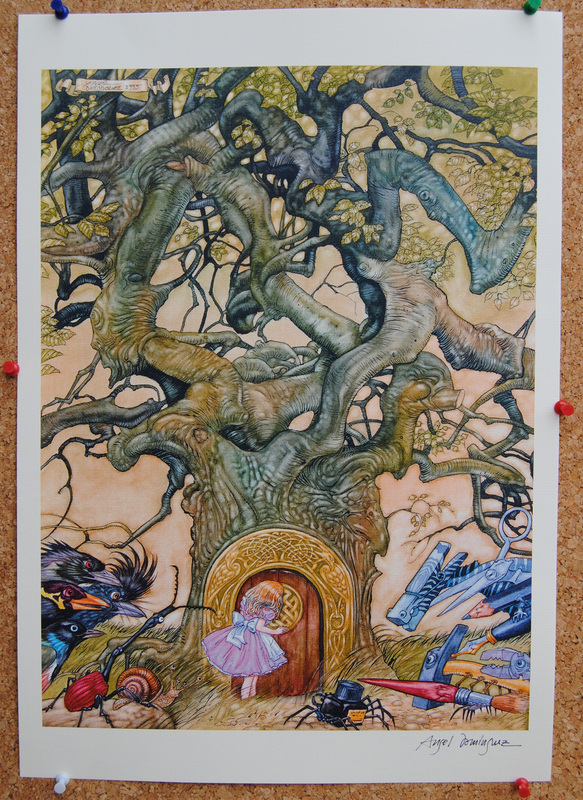 At Salisbury Museum, you can see the exhibition of Angel’s originals of Alice in Wonderfland, together with his illustrations for Narnia and Tales by Hans Christian Andersen. The items are for sale. 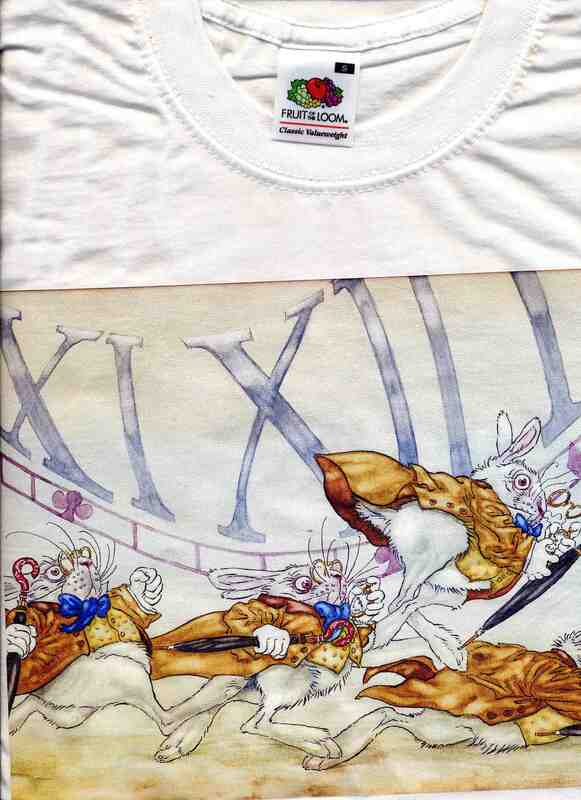 T-Shirts featuring designs based on Angel’s paintings are now available [including of the white rabbit painting to right]. Price: 20 euros. Quality: Fruit of the Loom, High quality. 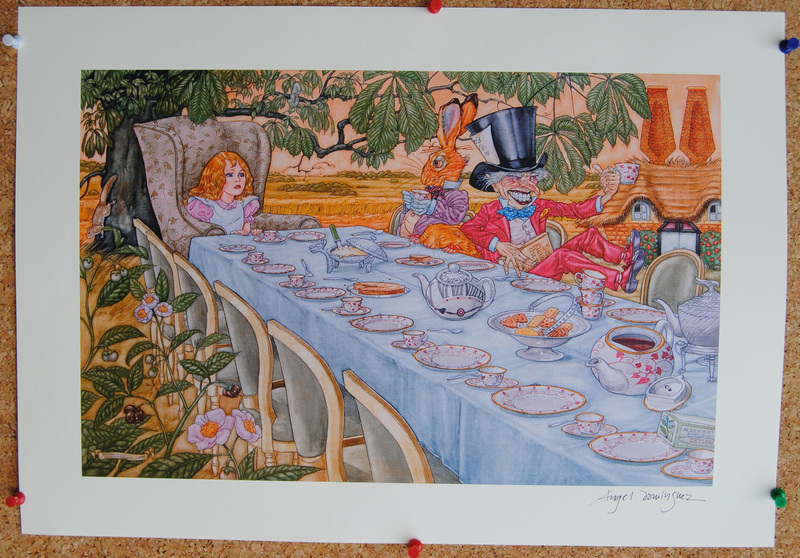 Mad Hatter's Tea Party, signed print for sale.